For a multinational pharmaceutical corporation, Schreiner MediPharm, in cooperation with ECCT, developed a smart blister pack for digital patient compliance monitoring to enhance medication adherence by clinical trial participants. Employment of this electronic tool to manage and track processes during clinical trials marks a milestone for the pharmaceutical manufacturer. Janssen Research and Development, a Johnson & Johnson subsidiary, will launch the first clinical trial to use its iSTEP technology toolset based on ECCT’s Mediccine Techonolgy, which employs smart blisterpacks and a patient-facing smartphone app, by the end of the year. 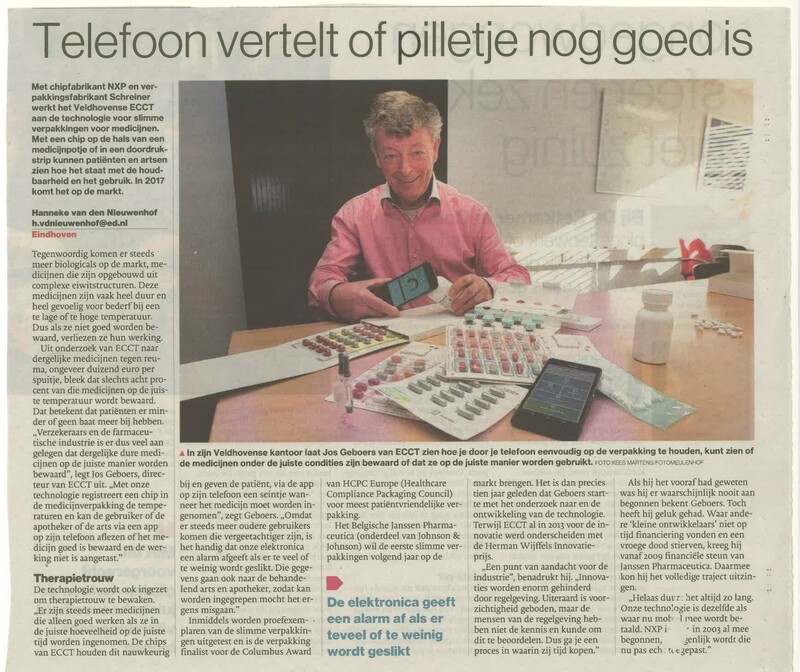 In an interview with the Eindhovens Dagblad newspaper ECCT’s director, Jos Geboers, tells about the progress that has been made over the last few years and the current status of ECCT’s Mediccine™ technology, as he prepares to launch the product on the market in the New Year. ECCT’s marketing director, Gerrit Menting, explains how ECCT’s smart package technology is being used to improve medication therapy adherence and to monitor the shelf life of the medication. You can read the complete article (in Dutch) here. ECCT is currently implementing Mediccine™ technology on the high-volume production lines of 2 large pharmaceutical companies in preparation for mass production of Smart medication packages. Further details to follow. ECCT’s Tempos technology is being used in a national trial aimed at increasing medication efficiency and reducing medication wastage. The trial involves 10 hospital pharmacies and 600 patients, and will be conducted over a period of 6 months. During the trial the patients will receive their medication from the pharmacy with the Tempos card included in the package. When the patients return to the pharmacy for a refill the data on the card is read and stored in the Mediccinet database. This data is then analyzed to determine whether the medication has been stored correctly by the patient. ECCT’s Temposcard temperature logging device wins the Herman Wijffels Innovation Award 2013. ECCT B.V. has won the prestigious Herman Wijffels innovation award, for the development of a system to reduce medicine wastage and to improve patient compliance using a sophisticated chip inside medication packages. ECCT’s Temposcard temperature logging device nominated for the Herman Wijffels Innovation Award 2013. ECCT B.V. has been nominated for the prestigious Herman Wijffels innovation award, for the development of a system to reduce medicine wastage and to improve patient compliance using a sophisticated chip inside medication packages.